What are the most popular online bachelor's degrees offered in New York? New York has one of the largest and most well-respected higher education systems in the United States. The state provides significant financial aid to local students, and the State University of New York (SUNY) system is dedicated to growing and supporting its distance learning community. The State University of New York's Open SUNY offering is a collaboration program that provides academic support and resources from all sixty-four SUNY campuses for online learners. Students who are interested in pursuing an online education in New York enjoy the flexibility of attending class wherever and whenever it is most convenient for them. They will learn from experience professors dedicated to their academic success, and can explore a variety of opportunities throughout the state's many online schools. Located in the heart of the Big Apple, New York University is an internationally revered institution and unquestionably one of the best online colleges in New York. Founded by the former Secretary of the Treasury under President Thomas Jefferson, New York University grew from humble beginnings in 1831 to become one of the largest private institutions in the nation. As one of only 60 schools distinguished by the Association of American Universities, it should be no surprise that nearly 50,000 students elect to enroll at NYU, either at the NYC campus or online. The Paul McGhee Division of the School of Professional Studies oversees 12 bachelor’s degrees currently available fully online. These programs include studies in areas ranging from applied general studies to real estate, with options in technology, communications healthcare, marketing, and leadership. Students at Saint Joseph’s College can take advantage of two brick-and-mortar campuses or the highly successful online offerings. With a commitment to being a small, liberal arts school – with approximately 1,200 current students – SJC has been unwavering in that commitment since 1916. Although there are many New York online colleges, only SJC offers the support of one faculty member for every three students. These numbers also hold true for online students taking advantage of one of the five fully online bachelor’s degrees available. In addition to these programs, the school has two additional dual B.S./M.S. programs in Human Services Leadership and Healthcare Management. The school is supportive of military students, be they active service members or veterans, and currently has a Student Veterans of America organization for both campus-based and online students. With an internationally respected research branch and a commitment to academic excellence, it’s easy to see why Stony Brook University is one of the best online colleges in New York. With nearly 26,000 students taking advantage of 200 undergraduate programs, the Center for World University Rankings places SBU in the top one percent of all colleges and universities in the world, with Nobel laureates, Guggenheim fellows, and MacArthur Genius grant recipients among its ranks. Online courses are provided via the School of Professional Development in an asynchronous format to help students with existing careers and responsibilities find time to complete degree coursework. All programs are delivered via Blackboard, an intuitive learning platform used and respected by thousands of learning institutions across the world. Online students can are taught by the same qualified and experienced professors leading campus-based classes. With 12 Pulitzer Prizes awarded to alumni from the photography department alone, it’s safe to say that the Rochester Institute of Technology is doing something right. During the previous year, the institute also saw three students gifted with Fulbright scholarships, all-the-while hosting 40 international recipients on its campus. As one of the best online colleges in New York, RIT started in 1829 as the brainchild of a few residents of Rochester who wanted to get together and talk about literature, science, and the arts. Today, the school is home to more than 15,000 undergraduates and nearly 3,300 graduate students. The school offers two online bachelor’s of science in applied arts and science or applied technical leadership, while the School of Individualized Study allows students to create their own courses of study from more than 300 online courses. Offering the “quintessential college experience” to students interested in attending one of the best online colleges in New York, Syracuse University has both the experience and esteem needed to attract learners from every corner of the nation. As the first school in the U.S. to offer a bachelor of fine arts, the school is always working diligently to be on the frontline of change and progress. Nearly 16,000 undergraduates currently take advantage of more than 200 degrees, including two offered fully online. As of 2017, the two Bachelor’s of Professional Studies available include programs in Creative Leadership and Knowledge Management. Aside from online courses, the University College’s Professional Development also offers a range of lecture series and academic services to ensure every student has the support they need to succeed. Seminar subjects include computing services, internship assistance, The Math Clinic, tutoring, writing assistance, library support services, and information on study abroad options. The University of Rochester, located in Rochester, New York, is an exceptional option for distance learners looking for online colleges in New York state. A private research university with an enrollment around 11,000, Rochester offers a variety of online courses, certificates, and degree programs. Online degree subjects include nursing, business, education, and engineering. A competitive school to get into, Rochester has no formal admissions requirements, but instead considers each student holistically on a case-by-case basis. Distance learners use the Blackboard learning platform to access course materials, and online content is delivered asynchronously. Some Rochester online programs, such as the executive MBA from Rochester’s Simon School of Business, are available in a hybrid format, combining online and on-campus learning. Individuals in the EMBA program meet on campus three times a month and receive online instruction for the remainder of the course curriculum. EMBA students also have the option to attend one of the three on-campus session virtually using Blackboard Collaborate software. Prospective students exploring options for online schools in New York may want to look into distance learning opportunities at SUNY College at Brockport. The four-year liberal arts college is part of the State University of New York (SUNY) system of accessible, high-quality educational facilities. Support for distance learners at Brockport includes a proctoring service, Blackboard help desk, general IT assistance, access to the Drake Memorial Library resources, and remote access tutoring. Brockport offers both fully online asynchronous courses and hybrid courses combining online and on-campus learning. Brockport offers one undergraduate degree program online: a nursing RN-to-BSN fast-track program for registered nurses possessing a nursing associate degree. The school also offers master’s degrees and graduate certificates. The eight online master’s of science education programs include specializations in adolescence biology, bilingual education (Spanish), and adolescence social studies. Excelsior College in Albany, New York, specializes in providing online education for working adults. Of the online schools in New York, Excelsior stands out for offering certificates and degrees in more than 30 different fields, including business, health care management, history, liberal studies, and nursing. Bachelor’s and master’s degrees are both available online. Many of Excelsior’s distance degrees allow students to add a concentration to their major for increased specificity in their final degree. Students pursuing a master’s of business administration may choose from nine possible concentrations, including cybersecurity management, social media management, and human performance technology. Admissions requirements vary by program, but most undergraduate programs offered by Excelsior do not have special admission criteria. Admissions criteria for graduate degree programs at the school also varies by department and field; however, the GRE and GMAT are not required by Excelsior for admission to their graduate programs. Students looking for online colleges in New York interested in criminal justice should consider CUNY John Jay College of Criminal Justice in New York. John Jay offers online graduate degrees, certificates, and degree completion programs with asynchronous coursework. Online programs include an advanced certificate in terrorism studies, a master of arts in international crime and justice, a bachelor of science in security management, and a master of public administration: inspection and oversight. John Jay’s Division of Professional Studies offers development and training online courses for professionals working in law enforcement, corrections, intelligence, emergency services, and fire. These courses do not count for credit toward a degree program. Admissions criteria vary by program, but students applying to any John Jay graduate program must have a bachelor’s degree from a regionally accredited college or university and a minimum 3.0 GPA. Full-time students may choose to pay tuition per semester or per credit, while part-time students must pay tuition per credit. Marist College in Poughkeepsie, New York, offers nine online degree and certificate programs, including eight at the graduate level. Not all online schools in New York offer a bachelor’s degree completion program, but Marist offers a BA or BS completion program in professional studies. Marist’s graduate program disciplines include business administration, public administration, and integrated marketing communication. The school also gives students the chance to pursue numerous accelerated-format online undergraduate courses. Asynchronous coursework is delivered through iLearn, a collaborative learning platform that encourages interaction with fellow classmates and instructors. Online students undergo a orientation experience to help familiarize themselves with the online learning environment. Applicants to Marist’s online programs must submit official high school transcripts, any college transcripts, and a personal essay. Military and veteran students benefit from a 25% tuition discount. Davis College is a Bible-centered higher education institution located in Johnson City. Established in 1900, the school is the only regionally accredited Bible college in New York State with dual accreditation from the Middle States Commission on Higher Education and the Association for Biblical Higher Education. Students have the option to learn on campus, at a satellite location, or online. The college currently offers programs such as Bible and TESL certificates, AAS programs, and a bachelor of religious education degree with 13 different concentrations. Concentrations include intercultural ministries, pastoral studies, Christian counseling, organizational leadership, teaching English as a second language, and Christian ministries with a teacher preparation emphasis. All of Davis' programs are offered online, except the music and worship leader concentration. Classes last eight weeks and are offered in a flexible format. Part of the State University of New York (SUNY) system, SUNY Polytechnic Institute in Utica, New York, presents one option for students applying at online colleges in New York. SUNY Polytechnic’s nine online programs include degrees in nursing, health information management, accountancy, and cybersecurity. Undergraduate and graduate degrees and one post-bachelor’s certificate are available. SUNY Polytechnic accepts the Common Application and the SUNY Application for first-year and transfer students pursuing a bachelor’s degree. Each graduate program requires specific supplemental materials in addition to your college transcript and a GRE or GMAT score. Most courses are delivered asynchronously, although some instructors may require real-time participation. SUNY Polytechnic uses the Blackboard system to deliver course content. Distance learners benefit from access to the school bookstore, library, a learning center, and career services. As one of numerous New York online colleges operating within the State University of New York (SUNY) system, SUNY College at Oswego currently serves more than 8,000 students annually, with 7,000 of them working toward undergraduate degrees. Originally founded to train future primary school teachers in 1861, today the school offers three online bachelor’s degrees in broadcasting and mass communication, public justice, and vocational teacher preparation. Chosen as one of the first SUNY colleges to take part in Open SUNY, the school is on the frontline of providing the best and latest in distance education. Students log-in to myOswego to access courses, interact with peers and professors, and turn in assignments. The school is well-regarded for its commitment to making education affordable for all learners: during the previous academic year, the school provided nearly $6 million in merit scholarships and more than $80 million in need-based grants, loans, and work-study awards. The public institution SUNY at Albany is also part of the State University of New York (SUNY) system and a good option for prospective students looking at online schools in New York. SUNY Albany has 20 years of experience delivering online education. Although distance students do not get a tuition discount, difference in tuition costs for residents and non-residents are under $100. All fully online students also benefit from lower student fees, ensuring you pay for only the services you use. Online students have access to tutoring, a disability resource center, and library services. SUNY Albany offers one fully online undergraduate degree, a BS in informatics. Prospective graduate students can choose from more than a dozen 100% online master’s degrees and certificates. An MS in reading, certificate in Teaching English to Speakers of Other Languages (TESOL), and a master of public health in public health practice are all available fully online. While there are many quality online colleges in New York, few boast a Vincentian heritage. Taking St. Vincent’s conviction that God is found in oneself when in service to others, St. John’s University is committed to inspiring learners to use their educations to improve the world. The 147-year-old school currently has seven worldwide campus locations: Queens, Staten Island, Manhattan, and Oakdale in New York; Rome, Italy; and Paris, France. Students can choose from more than 100 degree programs ranging from associate to PhD, including three online bachelor’s degrees. These currently include administrative studies, criminal justice, and liberal studies. Virtual courses are conducted via Blackboard and, although students are always welcome to visit campus, they are never required to do so. While all classes are taught asynchronously, professors and administrators are always on hand for a real-time discussion if a student needs advising or extra support. Distance learners interested in online colleges in New York should apply to SUNY College of Plattsburgh, in Plattsburgh, New York. SUNY Plattsburgh offers four online programs, including a BS in accounting, an RN-to-BS completion program, a MS in fitness and wellness leadership, and a teacher leadership graduate certificate. SUNY Plattsburgh online course delivery is facilitated through Moodle Learning Management System. Online students can enroll part-time or full-time, depending on what best suits their needs. In-state online students receive discounted tuition. Freshman and transfer students can easily apply with the Common Application or the SUNY Application. Some graduate programs may require completion of the GRE or MAT test for admission. Online learners can call, email, make an appointment with, or live chat with a librarian for research assistance. Plattsburgh’s Claude J. Clark Learning Center offers free online tutoring and access to academic personal trainers. With an undergraduate population of more than 5,200 students – in addition to 2,500 graduate learners – opportunities for students seeking a four-year degree abound at Adelphi University, one of the many online colleges in New York. Degree programs are divided into seven different schools covering topics ranging from liberal arts and business to science and social work. In addition to other distance learning degrees, Adelphi currently offers one fully online degree: a Bachelor of Science in Emergency Services Management for students looking to be on the cutting edge of today’s emergency services workforce. Throughout their academic career, students can lean on the university when they need support in planning their futures, bettering their writing skills, finding internships, preparing for the job search, and transitioning to the life of a graduate. Students can also take part in a number of online student clubs and organizations, both around their degree area and outside hobbies, interests, or leadership programs. Houghton College, a Christian liberal arts institution in Houghton, New York, is affiliated with the Wesleyan Church and ranks among the top online schools in New York. Five bachelor’s degrees and one associate degree are available to distance students, including programs in human resource management, leadership development, and psychology. Houghton’s online associate of arts offers concentrations in management, leadership development, human resources management, and integrated marketing communication. The program can be completed in as little as 18 months with full-time study. Freshman and transfer applicants to Houghton must submit high school transcripts and a personal statement. SAT and ACT score submission is optional for admission to Houghton, as the college operates a holistic admission process. All of Houghton’s degrees for distance learners are available fully online, with no in-person requirements. Eight-week courses and six start times each year allow students to complete programs at an accelerated rate. When compared to New York online colleges, Roberts Wesleyan College in Rochester is unique in its approach to online learning. Rather than offering full, four-year degrees, the college focuses on providing online bachelor's bachelor's completion programs for adult students who have already completed an associate degree at a community college or other accredited institution. Students can choose from programs in organizational management, health administration, or an RN to BSN program for students looking to further their educations. Although Roberts was started as a seminary in 1866, the school obtained a charter in 1949 to offer four-year degrees and subsequently changed to its current name. Still maintaining its Christian heritage, today the college appeals to adult students who are looking to balance their work and family life. Saint John Fisher College, a private liberal arts school in Pittsford, New York, offers both career-focused and traditional academic programs, similar to other online colleges in New York. Saint John Fisher’s RN to BSN online program offers students the opportunity to finish their bachelor’s degree at an accelerated pace, in as little as 12 months. The online MS in library media provides certification in library media to already licensed teachers and can be completed in 12 to 18 months. Distance learners benefit from 24/7 access to online tutoring services. Online students pay the same tuition rate regardless of where they live and are eligible for the same financial aid opportunities as on-campus learners. One in three students at St. John Fisher College is a transfer student. Transfer Achievement scholarships are awarded to full-time students with a cumulative 2.75 GPA or higher to help with tuition. St. John also offers rolling admissions with no formal deadlines for applications. As a member-school of the prestigious SUNY system, it’s no wonder that the Delhi campus ranks amongst the best online colleges in New York. First chartered in 1913, the university has morphed into a flourishing student body of 3,600 learners taking advantage of more than 50 degree programs. CTD also has the distinction of being part of an elite group of institutions to receive the Carnegie Foundation Elective Community Engagement Classification, while also being part of the President’s National Honor Role for Community Service for nine years running. As of 2017, online learners can take advantage of three fully online bachelor’s programs: a BA in Hospitality Management, a BS in Criminal Justice, or the RN to BSN degree path. Courses are delivered via Moodle, and are offered in an asynchronous format and class sizes average 12 students. Distance learners who want to pursue a degree at one of the online schools in New York state might consider the New York Institute of Technology. Located in Old Westbury, New York, NYIT offers eleven career-focused academic programs online with no in-person requirements. NYIT offer master’s and bachelor’s degrees and certificates. One such program is the bachelor’s degree in interdisciplinary studies, which allows students to choose three concentration areas from an extensive list. Other online programs at NYIT include an advanced certificate in environmental management and a master of science in childhood education. Over 20% of each incoming class at NYIT are transfer students, and NYIT prepares a personalized evaluation of your previous college credits after you enroll. Admissions requirements vary by program, and NYIT accepts applications on a rolling basis, with no specific program deadlines. As the final SUNY school to make the list of the best online colleges in New York, the College of Technology at Canton provides focused and career-driven educations to more than 3,200 students from New York and further afield. Canton Online, the arm of the college devoted to distance education offers nine online bachelor’s degrees currently, with the addition of two “2+2” programs - for learners who have already completed an associate degree – in nursing and veterinary service administration. While the majority of students are comprised of recent high school graduates (the average student age is 20), hundreds of adult learners also find what they’re looking for at CTC. For those seeking a reasonably priced education, the college offers one of the lowest rates for public education in the state; meanwhile, 85% of students received some type of financial aid – be it scholarship, grant, loan, or work-study program – during the previous academic year. Founded in the years after World War II, Mercy College has always held true to one guiding principle: to get the most out of life, it’s important to get the most out of education. Today students can take advantage of more than 90 degrees via campus offerings and online degree programs. As part of The PACT Advantage program, every student is assigned a PACT (Personalized Achievement Contract) mentor to help them navigate college and beyond. For cost-conscious students, MC is proud to offer one of the lowest tuition rates amongst private colleges in the nation alongside substantial scholarship and grant opportunities. Once an online learner is enrolled, they’ll use Blackboard to navigate asynchronous lessons, communicate with faculty and classmates, and turn in assignments or exams. At present, learners can choose from 10 fully online bachelor’s degrees in areas ranging from corporate and homeland security management to psychology. Some programs – including behavioral science and business – also have numerous concentrations available to help students further hone their studies. Our affordability methodology considers value-driven metrics and ranks schools that have low tuition rates, as well as proven graduation rates and employment outcomes that provide a high ROI for students. For students in New York, there are plenty of opportunities to find an affordable program locally. While distance education provides more flexibility than an exclusively residential curriculum, there are still plenty of advantages to attending a local online college, including access to lower tuition prices and local scholarships. If you're considering going back to school, and are thinking about studying online, the following list of cheap accredited online colleges in New York will help you start your search. Stony Brook University offers online bachelor's degree completion programs in electrical engineering and nursing; online master's degrees in higher education administration, liberal studies, human resource management, nutrition, and nursing; online graduate certificates in educational leadership, coaching, higher education administration, nutrition, and nursing; and an online doctorate of nursing. Most course content is delivered asynchronously, but some classes may include a synchronous or in person component such as exams, meetings with instructors, and hands on experience requirements. GPA requirements for transfer applicants vary from 2.5 to 3.0 depending on the program. Tuition is charged per credit. Online students may be eligible for financial aid, making Stony Brook one of the more affordable New York universities. St. Joseph's College offers 15 online academic programs, including minors, bachelor’s degrees, and certificates. The school offers nine undergraduate degrees, including religious studies and criminal justice. Classes are offered asynchronously. Tuition rates are the same for undergraduate and graduate students, making St. Joseph’s one of the most affordable online colleges in New York for graduate students. Students may transfer up to 90 credits for undergraduate programs and six credits for graduate programs. Founded in 1831, New York University offers 39 programs either primarily or completely online. Online graduate degrees include professional writing, translation, and human resource management and development. Undergraduate programs include leadership and social science. Online classes at NYU typically involve a mix of synchronous and asynchronous instruction, giving distance learners the flexibility they need to incorporate study time into their busy schedules. The university requires standardized test scores for applicants who have not completed a year of college or 32 credits. Applicants seeking early admission should have their applications in by the beginning of November; other prospective students should submit all the necessary paperwork by January 1. SUNY College of Technology at Delhi is one of the most affordable online colleges in New York. Tuition is charged per credit and various financial aid packages are available, including discounted rates for veterans of military service. Students may transfer up to 50% of their program credits from another accredited institution as long as they earned at least a "C" grade in each of the transferred courses. Students in associate programs must earn at least 30 credits at SUNY Delhi, and undergraduate students must earn at least 60 credits at SUNY Delhi. Classes are delivered asynchronously through Moodle. Students are not required to be present on campus at any time while they're in school. Syracuse University offers three online master’s degrees, including an MS in library and information science with a specialization in social media. All online students must attend a weekend immersion experience at the main campus in order to meet faculty and other students. Students can use a mobile app to access coursework anywhere. Distance leaarners may transfer a maximum of 66 credits from two year schools and 90 credits from four year institutions. Undergraduate students must complete at least 30 credits at Syracuse. Adelphi University in Garden City offers one online associate degree, one online bachelor’s degree, and five online master’s degrees. The associate and bachelor's degrees are both in emergency services administration. Master’s degrees are available in educational technology, emergency management, healthcare informatics, nutrition, and sport management. Online courses are available asynchronously through the Moodle course management system. Admission requirements vary by program. Unlike many other colleges in New York, Adelphi takes a holistic approach to prospective student evaluation and generally does not impose minimums on GPA or test scores. Distance learners at Adelphi may apply for all forms of financial aid and select students may qualify for discounted tuition. Located in Rochester, Roberts Wesleyan College offers bachelor's degree completion and master's degree programs in business, health administration, nursing, and teacher education. Coursework is available asynchronously so students can access lectures, participate in online discussion forums, and turn in assignments at their own convenience. Applicants to the bachelor's degree completion programs must have at least 60 transfer credits. These can come from accredited institutions, professional training, life experience, or passage of prior learning examinations. Requisite GPA and test scores vary according to requirements of each specific program. Online students may benefit from tuition assistance programs for veterans or employee reimbursement. Rochester Institute of Technology offers over 30 undergraduate and graduate programs online in crafts, design, business, computing, engineering, healthcare, mathematics, the humanities, and education. Coursework is asynchronous, but some classes may integrate synchronous components such as live chat or web conferencing. RIT is committed to making online education affordable for as many students as possible. The school provides deep discounts on tuition to distance learners. Online graduate students receive a 43% discount off standard tuition rates and online undergraduate students receive a 36% discount off the standard part-time undergraduate tuition rates. These discounted rates make RIT one of the most affordable online colleges in New York. SUNY Oswego offers eight online degree and certificate programs, including bachelor's degrees in broadcasting and public justice, and a master's degree in business administration. The school also offers advanced certificates in behavioral forensics, health information technology, and integrated health systems. SUNY Oswego's distance learning courses are asynchronous. Students do not have a residency requirement. Applicants may transfer a maximum of 67 credits from two year colleges and 97 credits from four year universities. In order to qualify for admission, applicants must have a cumulative GPA of at least 2.3 if they have completed more than 30 credit hours or a cumulative GPA of 2.5 if they have fewer than 30 credit hours. Medaille College in Buffalo offers three online associate degrees, five online bachelor’s degrees, and four online master’s. Notable programs include the master of arts in sports psychology, bachelor of science in homeland security, and associate of science in veterinary technology. The school also offers an advanced certificate in clinical mental health counseling. Courses are offered asynchronously through Blackboard. Students in bachelor’s programs may transfer a maximum of 90 credits from a four year college or 72 credits from a two year college. A maximum of 45 credit hours may be transferred into an online associate program. Pace University in New York City offers several 100% online bachelor’s degrees through the iPACE degree completion program. Students may earn their bachelor's degree in business studies, nursing, professional communication studies, or professional technology studies. Online master's programs are available in publishing, internet technology, and enterprise analytics. Courses are taught asynchronously with no on campus requirements. Students may transfer credits from an institution accredited by a regional affiliate of the Commission of Higher Education. Students may transfer a maximum of 68 credits from a two year college or 90 credits from a four year college. The New School in New York City, offers five online associate degrees and nine online bachelor’s degrees, including an associate in fashion marketing, a bachelor’s in global studies, and a bachelor’s in musical theater. Course material is available asynchronously, allowing students to complete classwork on their own schedules. Students may transfer up to 84 credits into an online bachelor's degree. Credit may also be awarded for prior learning or experiential learning. Online students may apply for financial aid, including scholarships for transfer students and discounted tuition for military veterans. Located in Dobbs Ferry, Mercy College offers over 30 online programs, including undergraduate and graduate degrees. Fields of study include behavioral science, business, education, cybersecurity, and nursing. Courses are accessible 24/7 through an asynchronous platform. Mercy takes a holistic approach to admissions, so SAT and ACT scores are optional for undergraduate applicants. Mercy accepts a maximum of 75 credits from two year institutions or 90 credits from four year institutions. Mercy has transfer agreements with a number of community colleges, nursing schools, and international universities in the area. Financial aid packages are also available. Located in Johnson City, Davis College offers undergraduate degrees and certificate programs online. High school students can take online courses for dual enrollment. Unlike many other colleges in New York, Davis is a Bible-centered school that frames education through a Christian perspective. Available programs include religious education, intercultural ministries, pastoral studies, organizational leadership, and Christian counseling. Classes are available through Blackboard CourseSites. Students may transfer 60 credits from a previous institution. Credits may also be earned by completing the College Level Examination Program. Serving nearly 3,000 students on New York campuses and through distance learning, the Sage Colleges deliver degrees at the certificate, bachelor's master's, and doctoral levels. These include online programs in applied nutrition, business administration, and applied behavior analysis. Featuring flexible scheduling options, the schools' online degrees are designed for working professionals and other students with outside commitments. Distance learners can also choose to complete most programs in an accelerated format to earn their degree in a shorter time. All distance learners at Sage pay the same tuition, regardless of their state of residency, making Sage one of the most affordable online colleges in New York for out-of-state students. No standardized test scores are required for any undergraduate applicants. Sage accepts a maximum of 90 transfer credits in good standing. With campuses in Queens, Staten Island and Manhattan, St. John's University offers fully online programs at the graduate level. Notable degrees include business administration, educational leadership, and theology. The school also offers an online PhD in literacy. Tuition is charged per credit and is the same for online and on campus students. St. John's is not approved to admit students from every state, so prospective out-of-state students should contact the university before applying. Classes are conducted asynchronously using the Blackboard platform. Transfer credits are evaluated by the University on a class-by-class basis. St. John's provides student services to their online students, including academic advising, financial aid, library resources, and career services. St. John’s is one of the only Christian-focused colleges in New York. SUNY Canton offers 13 online degrees in areas such as business administration, criminal justice, finance, emergency management, and health care management. Courses are offered asynchronously using the Blackboard platform. SUNY Canton is one of the most affordable online colleges in New York. Tuition is lower for New York residents, and may even be free for residents who meet income and residency requirements. Financial aid is available for online students. Credits earned at other institutions will be evaluated for transfer credit. Dominican College is located 17 miles north of New York City in Rockland County. Dominican offers five fully online accelerated bachelor's degree programs: sociology, communication studies, management, criminal justice, and psychology. Classes are offered asynchronously. Students may transfer up to 70 credits from an accredited two year college or 90 credits from a four year institution. At least 30 credits must be completed at Dominican. Transferred courses must have been passed with a minimum "C" grade. Students are charged a flat tuition rate for 12-19 credits per semester. Loans, grants, and scholarships are available. Applicants must have a GPA of 2.0 or above. A Christian institution of higher education, Nyack College serves over 2,500 students on multiple campuses and through distance education programs. The school offers associate, bachelor's, and master's degrees online in fields like marketing and childhood special education. Nyack uses a cohort format in most of its distance learning programs. Online students work with an assigned faculty mentor who guides them through their program from the first day of class until graduation. Applicants for undergraduate programs must provide scores from the SAT or ACT, along with high school transcripts and a recommendation from their pastor or spiritual leader. Transfer students must submit all college transcripts. Nyack offers several forms of financial aid, including scholarships, loans, and work-study programs. Utica College offers more than 25 fully online degree programs in areas such as business administration, healthcare administration, and liberal studies, as well as several certificate programs in cybercrime detection and prevention. Most online courses are offered asynchronously, although some instructors require a weekly online meeting. Online students are assigned a student success coach who advises them on registration issues and online resources. Utica also offers hybrid programs for students who wish to take some classes on campus. Tuition varies with the program chosen. Financial aid is available to online students. Students may transfer courses from regionally accredited institutions. Tuition costs in New York have increased recently. In-state tuition in public 4-year schools has jumped 18% over the past decade, while funding for higher education has plummeted 11% since 2008. College students interested in New York's schools are increasingly pursuing online options, where tuition and auxiliary costs are lower than at traditional programs. 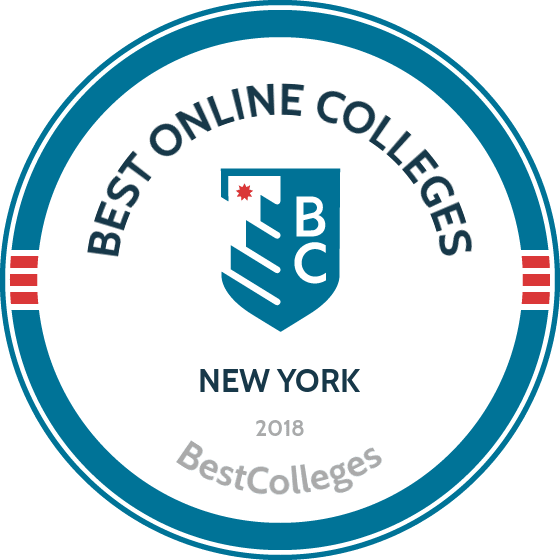 Browse our list of the best online colleges in New York for more insight into distance learning programs in this state. College students pursuing online education in New York are supported by the state legislature and the New York's Department of Education. New York launched a distance learning initiative in 2014, and it has successfully expanded distance learning options statewide, even branching into regional high schools. Another visible example of departmental support is the Open SUNY program. Unlike any other program in the country, Open SUNY brings online learning options to students registered at any of the 64 campuses in the SUNY system. SUNY students can access a rich catalog of high-quality courses developed and delivered by faculty from all over the state. Online classes complement classroom-based degree programs and, in many cases, help students complete their degree. The comprehensive online study options in New York make it one of the most attractive places to learn in the U.S. According to data from the 2016 IPEDS report (published in November 2017), most online bachelor's degrees offered in 2016 in New York were in Business Administration and Management. In New York, employment growth in this profession is strong. According to the New York State Department of Labor, long term projections show an increase of 23% in the total number of jobs relevant to this field between 2014 and 2024. Wages among degree-related careers increased by 6% from 2011-2016. What were the top careers in New York in 2016 for people who had a degree in Business Administration and Management? Data source: New York State Department of Labor, Bureau of Labor Statistics. Data may not be available for every year. Employment growth in this profession in New York is strong. According to the New York State Department of Labor, long term projections show an increase of 26% in the total number of jobs relevant to this field between 2014 and 2024. Wages increased by 7% from 2011-2016. In New York, what were the top careers in 2016 for people who had a degree in Registered Nursing? Employment growth in this profession in New York is strong. According to the New York State Department of Labor, long term projections show an increase of 177% in the total number of jobs relevant to this field between 2014 and 2024. Wages increased by 5% from 2011-2016. In New York, what were the top careers in 2016 for people who had a degree in criminal justice/law enforcement administration? Employment growth in this profession in New York is strong. According to the New York State Department of Labor, long term projections show an increase of 177% in the total number of jobs between 2014 and 2024. Wages increased by 5% from 2011-2016. In New York, what were the top careers in 2016 for people who had a degree in psychology? Employment growth in this profession in New York is strong. According to the New York State Department of Labor, long term projections show an increase of 88% in the total number of jobs between 2014 and 2024. Wages increased by 7% from 2011-2016. In New York, what were the top careers in 2016 for people who had a degree in liberal arts and sciences/liberal studies?